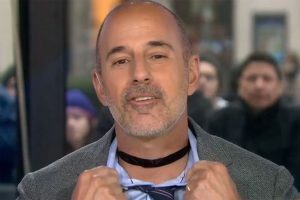 Lauer showing off a choker for men on The Today Show. We all woke this morning to Matt Lauer’s firing by NBC because of sexual predatory behavior. Word is now coming out that the behavior wasn’t the only thing for which he was guilty. He was also guilty of the further intimidation of the women whom he knew he had harassed in various ways to remain silent. It is also being reported that he was cultivating other journalists and reporters to remain silent themselves about the stories circulating about him. NBC moved as swiftly to remove him from The Today Show as CBS did to remove Charlie Rose from the CBS This Morning program when similar reports surfaced about him. But let’s be very clear about all of this. Although all these men have been rightly removed from their morning programs and their running of movie studios and their starring in Netflix series and their hosting of entertainment shows, etc., there is still one man who remains in his job and is guilty of the same behavior: Donald Trump. Indeed, more women have accused Trump of such behavior than have accused any of these other men. This cultural reckoning we are going through at this critical juncture in our country is a part of the larger critical juncture we are experiencing, which is a man of Trump’s low, vile character and mental capacity and racism and bigotry and sexual predatory history is sitting in the White House. These other men who are losing their jobs and being called to account are not scapegoats for they are rightly being called out and suffering the consequences, but they are our culture’s and our country’s sacrificial goats as the biggest goat remains in the Oval Office. As we finally begin to lance this festering social sore, we must not lose sight of the fact that this lancing does not solve or heal the chancrous and crassly cranky one that sits “unlanced” in the White House. Keep pushing back. Keep resisting. Keep asking this question. Call Donald Trump on the mat and make him answer that question over and over and over even as we are making others sacrifice not only for their behavior, but also for his.